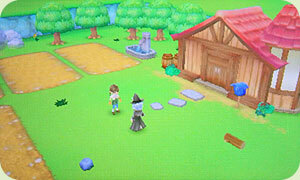 Harvest Moon: A New Beginning is a farming simulation game for the Nintendo 3DS video game console. As the new farmer in town, it is your job to use your farm and its resources to revitalize a once-popular town. You can grow crops and raise animals, as well as interact with villagers and possibly get married. This game will not be released for the Nintendo DS console - it is exclusively for the 3DS. The game was released early by Natsume in North America and started shipping on October 19th instead of closer to its original street date, November 6th. There is also a digital download version of the game for sale in the Nintendo 3DS eShops. The download version requires 2739 blocks of SD memory card space. The game was launched both retail and digital format in Europe, but the game's language was not changed. There is not a German, French, or Italian language version of the game; English only for all of Europe. It is said that a long time ago, a lot of people lived in Echo Village. Now the place is practically deserted. One after another, the villagers moved away to the city. Now only a few residents still live here. Near the desolate village is a small farm. You have inherited this old farm from your father and have traveled to Echo Village to work and live on your family farm. On your way to the farm you run across a man who has passed out on the walking path. After you help him regain consciousness, he explains that his name is Dunhill and he's heard about you from your parents, with whom he has been friends with for a long time. They had wrote him a letter stating your arrival. He shows you around the village, explaining its history, and leads you to your farm. As you start to develop your farm, the two of you come up with a plan to revitalize the little town. By using the construction workshop attached to your farmhouse, you'll need to build decorations and houses to entice the villagers who moved away to return to Echo Village. Dunhill will assign you a Town Renovation Plan which lays out a series of tasks that will help to popularize the town. Your task is to follow his plan, unlocking events and constructing structures, with the goal of reviving the empty village.